What yarn does everyone plan to use for the upcoming Mystery Sock KAL? 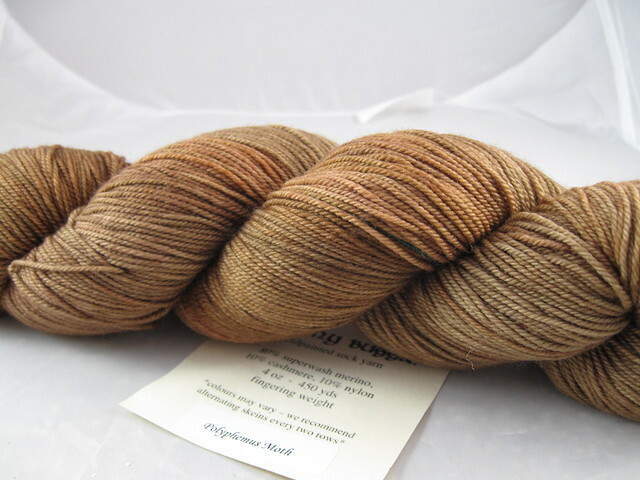 I loved the Sanguine Gryphon Bugga that I used for the Mystery Shawl KAL in May that I have decided to use my precious skein of Skinny Bugga for the Mystery Socks. The colorway is Polyphemus Moth. It looks brown but as I have been working on the pattern, I realize there is almost a little bit of this murky green in there. It is gorgeous! As I am prepping to leave for Sock Summit tomorrow, I have been making detailed lists of the booths I want to shop in at the marketplace. I have a feeling I am going to be doing some serious damage in the Sanguine Gryphon booth. I am officially addicted to this yarn.